Google Doogle celebrates mathematician Emmy Noether's 133rd birthday. Mathematician Emmy Noether’s 133rd birthday Doodle. 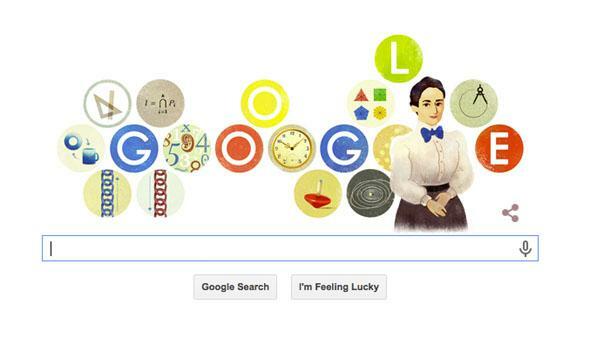 Monday’s Google Doodle honors mathematician Emmy Noether, because there ain’t no party like an 133rd birthday party. Noether made important contributions to theoretical physics and abstract algebra, in spite of the rampant sexism in early-20th-century academia that hindered her career. “Noether’s advancements not only reflect her brilliance but also her determination in the face of adversity,” Doodle artist Sophie Diao wrote. Noether was known as a devoted mentor throughout her career, even though she wasn’t even always paid or given a title at the two universities where she spent most of her career (University of Erlangen and University of Göttingen). Noether was dismissed from University of Göttingen because of her Jewish heritage and came to the United States in 1933 to teach at Bryn Mawr. She died in 1935. In the judgment of the most competent living mathematicians, Fraeulein Noether was the most significant creative mathematical genius thus far produced since the higher education of women began. In the realm of algebra, in which the most gifted mathematicians have been busy for centuries, she discovered methods which have proved of enormous importance in the development of the present-day younger generation of mathematicians. Stanislaw Zaremba does not, in fact, look like every mathematician ever.